The big question here is: What is matter made of? This is one of those childlike questions that you can keep asking over and over about the answers you get at each level. 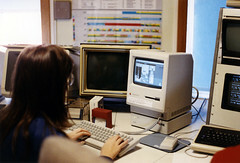 What is your computer made of? A case full of electronics, processors, disk drives, and so on. But what is a processor made of? Logic circuits. But what are logic circuits made of? Tiny transistors. But what are transistors made of? Even more tiny bits of semiconductor laid out on a rigid substrate. But what's the substrate made of? Silicon. But what's silicon made of? Aha! We seem to have bottomed out. If you take a chunk of silicon and start cutting it up to see what it's made of, you just get smaller and smaller pieces of silicon. You can keep going for as far as you can see, even with a powerful microscope, and all you ever see is smaller bits of silicon. How far can you go? Can you go "all the way", forever slicing off tinier and tinier bits of silicon, with no limit to how small they get? Or does the process end somewhere, with a smallest possible piece of silicon - either a piece that can't be cut into smaller pieces, or a piece of silicon so small that if you do cut it into smaller pieces it's not silicon any more? This is a very difficult and profound question. Wait just a cotton-pickin' minute! Let's just stop there for a second. This is one of the most profound and difficult questions about the very nature of the universe and reality that we as a species have ever asked. It mystified humanity for thousands of years. Yet our civilisation is now at a point where we routinely teach the answer to our children. That is utterly mind blowing. And if you have kids at school the right age to be learning about this stuff, I hope you can share with them at least some fraction of how astounding and amazing are the things that they are learning. Kids that age don't seem to appreciate much of this at the time, but they should. If your kids' science teachers aren't blowing their minds at least three times a week, they're letting a lot of good opportunities slip by. Anyway, nowadays the answer to this question is taught to children in school, so most of you will probably know the answer (unless you've forgotten). But the answer is far from obvious, because we can't see it easily with our own eyes. It's not part of our everyday experience like the facts that the sky is blue or that water runs downhill. In fact, it's so difficult to figure out the answer to this question, that it took humans at least 2000 years from when they first started wondering about it to when we finally worked out the answer. 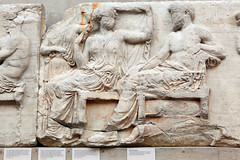 Ancient Greek relief of Hera and Zeus, British Museum. The Ancient Greeks built an impressive civilisation that spanned roughly 750 BC to 150 BC (after which they were conquered by the Romans). Their civilisation provides us with one of the earliest examples of a culture that left records of their ponderings of the natural world around them. One of the things they pondered was this very question: Is matter infinitely divisible, or is it made of discrete pieces that cannot be divided further? As far as the Greeks could tell, there was no physical way to answer this question. Some materials, like butter, say, can be divided into smaller and smaller pieces, until the bits are so small that you can't easily see them any more. Yet at each stage, the pieces are obviously still butter. But it was possible to imagine that butter was like a very fine-grained mass of sticky sand, in which it would eventually be possible that you could isolate a single particle of butter, such that this butter particle could no longer be cut into smaller pieces of butter. If this was the case, the particles were obviously much too small to see. But it didn't stop the Greeks from thinking about the possibilities. The Greek philosophers who thought about this problem split into two camps: those who argued that matter must be infinitely divisible, with no empty space anywhere, and those who argued that it must be made of small discrete particles, separated by gaps in which nothing existed (the "void"). These particles they called by the name "atoms", from a Greek word meaning "indivisible". The leading proponents of atomism were Leucippus and Democritus, and on the other side were philosophers such as Parmenides and Aristotle, who objected to the idea of a void between the atoms, stating famously that "Nature abhors a vacuum". They did not have the technology to actually test these competing theories by observation (nor indeed the philosophical concept of physical experiment as a means of discovering truths about reality), so their arguments were purely philosophical. In one of the first such cases in history, atoms were thus named long before they were actually discovered. The idea of atoms is bound up tightly with the concept of elements. The Greeks also had an idea about that. They thought that there were four essential types of matter, or elements: earth, water, air, and fire. Everything else we see around us is (they thought) made up of a mixture of these elements in various proportions. At its heart, this is an inspired idea and leads naturally to the idea that materials can be changed by adding or subtracting some component of their make-up. For example wood is a mixture of earth, a bit of water, some air (because it's relatively light and floats on water), and some fire. Occasionally the fire would escape, leaving behind ash, which is mostly just earth. From this example we also approach the idea of reactions, processes which change the nature of materials by adding or subtracting elements. But it was not until the late 18th century that physical evidence started mounting up on one side of the atomism debate. A particular obsession with chemisty (or alchemisty) types up to that time was the idea of turning other metals into gold. Assuming that gold is a mixture of earth, water, air, and fire in some proportions, and that other materials were likewise, it's only logical that by reacting other things together you could make gold, if only you can get the proportions right. But try as they might, nobody ever managed to pull this off. What they discovered while trying, however, was that certain other materials acted a bit like the classical elements were supposed to act. Pure metals like gold, silver, copper, iron, mercury, lead, and tin could be mixed together and with other things to create new materials, but there didn't seem to be any way to break these metals down into other component materials. Similarly for a few other otherwise unassuming materials such as brimstone, which we now call sulphur. This was a strong hint that perhaps these materials might actually be elements in the classical sense. The crunch came in the 1750s when Joseph Black discovered that air itself was made of other materials. He performed experiments that isolated carbon dioxide, a gas which he demonstrated had different properties to air (namely that it smothered fire and animals could not successfully breathe it). He didn't know what this mysterious gas was, exactly, and called it "fixed air". In rapid succession over the next two decades, British scientist Henry Cavendish produced hydrogen and recognised that it was different from air (he called it "inflammable air"), Black's fellow Scotsman Daniel Rutherford isolated nitrogen (which he called "noxious air", for it also smothered flame and animal life), and Joseph Priestley isolated oxygen (which he named "dephlogisticated air"). Suddenly it was clear that air wasn't all the Greeks had it cracked up to be. It was not an element at all. The nail in the coffin came in 1800 when Italian Alessandro Volta invented the voltaic pile, providing the first source of electric current. Within weeks, Englishmen William Nicholson and Anthony Carlisle used a voltaic pile to pass a current through water, separating it into the gases discovered by Cavendish and Priestley. Water was also not an element! And it was looking very much like hydrogen, oxygen, and nitrogen were elements, joining the list of metals and other substances. Now the discoveries and breakthroughs came thick and fast. Performing careful experiments, Frenchman Joseph Proust discovered that reactions between particular materials always consumed the raw materials and produced the products in very specific and repeatable ratios. For example: water always broke up into 8 parts oxygen by mass and 1 part hydrogen. Any water. And if you mixed oxygen and hydrogen and combusted them, you could produce water - and it was always the case that 8 times as much oxygen was consumed as hydrogen, leaving any extra behind. Proust found similar results with copper carbonate (made from copper, carbon, and oxygen), iron oxide, and iron sulphide. He formalised this finding in the law of definite proportions. What does this mean? Well, if matter is infinitely divisible, you might reasonably expect that materials could combine to form new materials in virtually any proportions you like. That they don't and that the ratios are fixed hints that perhaps what is happening is that a specific number of tiny particles of one substance join with a specific number of particles of the second substance to form particles of the product. This is not comprehensive proof but it is evidence that tips the balance towards considering that the Ancient Greek idea of atoms may be true (even if their elements were casualties left by the wayside). 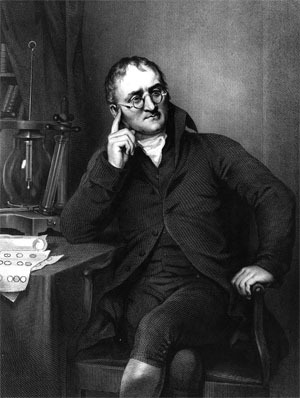 And so we come to Englishman John Dalton. Dalton began his chemical work with gases, examining how they behave under different pressures and how their volumes change when they undergo chemical reactions. He tried to figure out why Proust's law of definite proportions was true, and experimented with materials that combined in different ways, such as carbon and oxygen, which could produce carbon monoxide, or carbon dioxide (gases known by other names at the time); and nitrogen and oxygen, which produce nitrous oxide or nitrogen dioxide. His experiments showed that compounds formed from the same two elements always formed such that the ratio of masses of one element that combined with the same amount of the other element were fixed ratios of small numbers. For example, carbon dioxide was always made up of exactly twice as much oxygen as carbon monoxide, for the same amount of carbon (a fact that may seem obvious to us with the modern names for these gases, but a new discovery at the time). Dalton elucidated this discovery as the law of multiple proportions, also sometimes known as Dalton's Law. The next step was to propose a theory to explain these observations. Dalton realised that if the elements are made up of small indivisible particles—atoms, in other words—and that if they reacted such that a fixed number of atoms of one element combined with a fixed number of atoms of another element to form a particular compound, then the observations would fall out naturally. What's more, by looking at the relative masses of the reactants and products of various reactions, Dalton could deduce the relative masses of the atoms of each element. And when he did this, he discovered that the atomic masses of the elements he studied were neatly arranged such that they all seemed to be an exact multiple of the atomic mass of hydrogen. This pattern was enough for Dalton to formulate the first scientifically based atomic theory. Elements are made of small indivisible particles (atoms). These atoms are too small to see. Atoms cannot be created or destroyed. All atoms of one element have the same mass, while different elements are distinguished because their atoms are of different masses. Atoms combine in simple whole-number ratios to form non-elementary substances (compounds). In chemical reactions, atoms are combined to form compounds, separated from compounds, or otherwise rearranged. Dalton's model was not perfect, and he held on to some flawed ideas about ratios caused by the fact that oxygen (and other gases) typically exist as a compound of two atoms of the same element, not as lone atoms. These errors would soon be corrected by the Italian chemist Amadeo Avogadro, and from there atomic theory would never look back again. It was nearly a century later before further discoveries would open up whole new realms of wonder concerning the atom... but that is a story for another day. So, returning to our original big question: What is matter made of? It is made of atoms; tiny particles of stuff that are so small that we can't see them, feel them, or notice them in our everyday lives. But their existence can be deduced by experiment and careful observation, using nothing more than 18th century technology. Nowadays we have much more sophisticated ways of probing atoms and confirming their existence, but the groundwork was laid over 200 years ago. We've now found that there are over 100 different elements, and they combine in a multitude of ways to form everything that we see around us. Silicon is made of silicon atoms - each one a tiny piece of silicon, the smallest possible piece of silicon that can exist. And the thing about atoms is that once you know about them and their properties, you can explain and understand a lot of how matter works. Which is much of what makes everything. In my opinion, atoms are one of the most fundamental things that you need to know about if you want to have a deep understanding of how the world and the universe work - an understanding of everything. 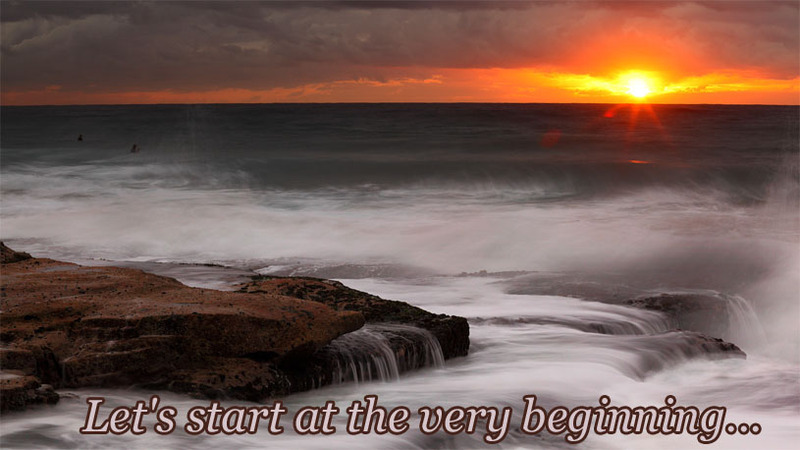 It's the very beginning. Which is why it's a very good place to start. The idea that "nature abhors a vacuum" is also known by the Latin phrase "horror vacui". Interestingly, this term is also used in art to describe works which have no empty spaces, every part of the work being filled with detail. After his favoured phlogiston theory of combustion, which is a story for another day. Or nitric oxide. Nitrogen and oxygen in fact can produce a vast number of different compounds with varying proportions of nitrogen and oxygen. Volta's pile, invented in 1800, counts because (in the years before 2000 confused everybody for some reason) 1800 was the last year of the 18th century. And Dalton's experiments in the next few years could have been done with no more than that plus equipment that existed earlier. Last Modified: Monday, 21 April 2014; 01:02:12 PST.